This is the life & times of the Yamaha Rhino It’s kind of hard to believe, but it’s been over 15 years since Yamaha unveiled the Rhino 660 UTV, the vehicle that introduced the world to sporty UTV performance and a whole new kind of off road fun. Released in 2003 as a 2004 model, there was nothing like it at the time. Vehicles that launch a whole new sport don’t come along very often, so I’m very glad I was on hand for the debut of the Rhino 660. At first, some people in the ATV industry didn’t know what to make of the Rhino, but its performance won skeptics over in a hurry. The phenomenon even caught Yamaha off guard as they we expecting to sell the vehicle to the hunting crowd in the central and eastern parts of the country. They had no idea what the guys out west had planed for the new fun machine. The Rhino has its roots in a project for a military vehicle based on the Grizzly 660 4WD ATV, which was powered by a carbureted, five valve, single overhead cam engine. The civilian vehicle was a huge hit from the beginning, and it started a thriving aftermarket industry and a sport almost instantly. At one point, Rhino modification and customizing shops seemed almost as common as Rhinos. 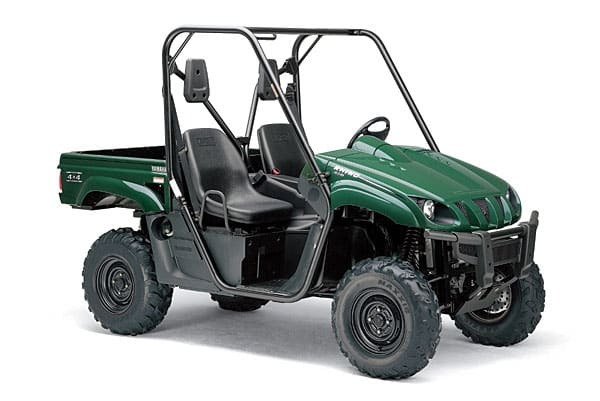 Yamaha followed the 660 with a less expensive 450 version, and then a 700 version powered by the Grizzly 700’s more powerful fuel injected, four valve engine. I can already hear fans of the Honda Odyssey, introduced in 1977, and the Honda Pilot from 1989 grumbling from their rocking chairs and angrily tapping their canes. They are cool machines and lots of people are still having fun with them. The Odyssey and Pilot were unquestionably ahead of their time, maybe too far ahead. I guess you could consider the Odyssey and the Pilot UTVs but they were not four wheel drive. They are off road vehicles that you sit in and drive, but both lack one of the key elements that made the Rhino and UTVs that followed so explosively popular, the ability to take a friend along for the ride. Utility value was also a big factor in the Rhino’s success. It was a standard setting sport machine for its time, but with a big bed for cargo, the Rhino also offered as much to utility users as it did to sport minded drivers. More than anything else, it’s the Rhino’s immense popularity and the way it inspired similar vehicles that make it one of UTVing’s most important vehicles. 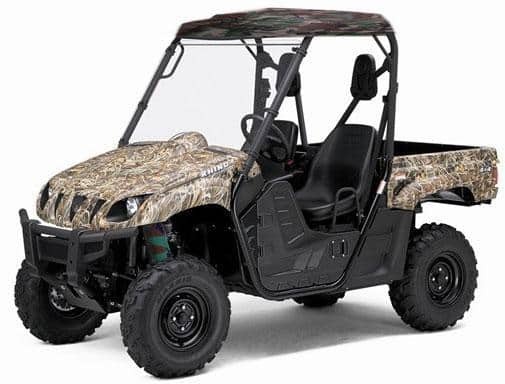 It is interesting that sport UTVs with less and less utility features have become the fastest growing UTV category. There’s no sign that performance is taking priority over taking friends along, though. Arctic Cat, Can-Am and Polaris, the makers of the most radical sport UTVs, all offer four seat versions of their pure sport models. Don’t scoff at four seaters because they hold more people; racers and other aggressive drivers are finding their longer wheelbases make them faster in whooped out terrain. It’s scary to think about all the fun we all would have missed if Yamaha hadn’t released the Rhino, and I’m not just talking about the fun we’ve had in Rhinos. Without the Rhino and the success it had, Polaris may not have released the revolutionary RZR 800. Without the RZR 800, would there have been a RZR S? Imagine a world without the RZR XP 1000, no Wildcat and no Maverick, but why be gloomy? I’d rather think about the vehicles to come that will be as revolutionary as the Rhino. Yamaha’s five speed YXZ1000R and the new Sport shift YXZ broke new ground, and Honda has finally jumped into the game. No matter what you drive, give the next people you see in a Rhino a thumbs up. UTVing wouldn’t be what it is today without it.